As we saw a couple of days ago, in 1964 Walt Disney’s Carousel of Progress opened at the New York World’s Fair in Flushing Meadows. It was built as the prime feature of the General Electric Pavilion. This picture was taken in 1965 towards the end of the Fair. 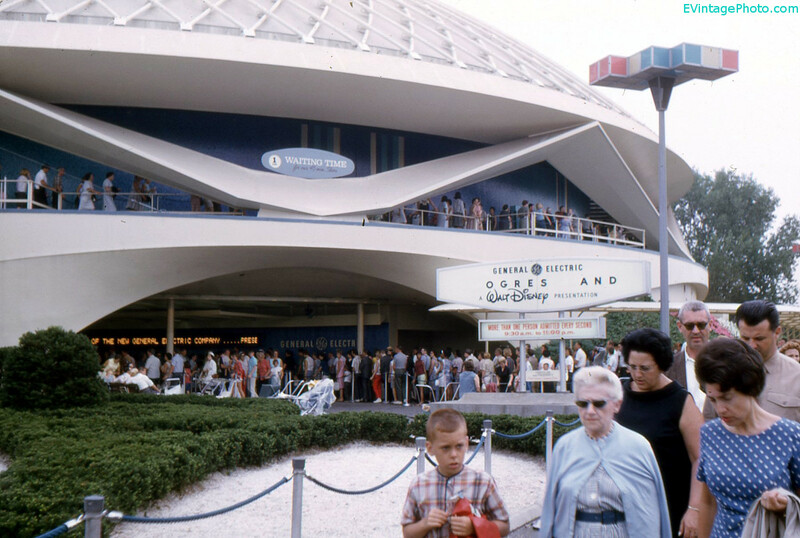 Vintage photo of the Walt Disney Carousel of Progress while at the 1964 New York World’s Fair. 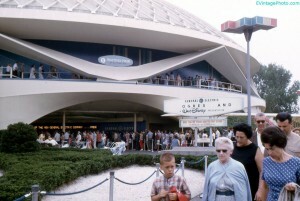 After the World’s Fair was finished, Disney’s Carousel of Progress was moved to Disneyland in Anaheim California. It remained there from 1967 until 1973. At the behest of General Electric, who were still sponsoring the ride at the time, it was then moved to Disney World Resort’s Magic Kingdom and opened in 1975. On the surface, this attraction looks dated and boring. But the attraction is one of the best showcases of Walt Disney’s “Audio-Animatronics” technology and has been updated five times to keep it up to date. I almost bypassed it last time I was at Disneyworld, but for some reason still went in. I’m glad I did as it was a great nostalgic look at yesterday (just like this blog,) and for a 60+ year old attraction, still holds it’s own quite well. If you pay attention the attraction still talks a lot about modern conveniences, built by General Electric of course, such as stoves, refrigerators, tv, etc. The last section, redone in 1993, shows a modern family home with kids playing video games on the TV in a virtual reality simulator. Funny thing about technology these days, even that is out of date.